Get UV and corrosion resistance when you choose plastic sleeved hand rail made of sturdy steel construction and corrosion resistant alloys. Keep pedestrian traffic under control and out of harm's way. Provide helpful hand holds for walking on steep or slippery surfaces. 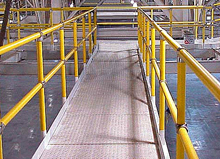 Handrailing built from 2" square, 14 gauge steel tubing and makes an excellent aisle way, machine guard rail, mezzanine rail or robot guard. It bolts up with standard hand tools making it easier to install and more cost effective by cutting down on time and labor.